Topol GA, Podesta LA, Reeves KD, et al. The chondrogenic effect of intra-articular hypertonic-dextrose (prolotherapy) in severe knee osteoarthritis. PMR. 2016;8(11):1072-1082. Nothing has been found that, upon injection, stimulates regrowth of cartilage over the entire joint surface in those with osteoarthritic knees that has become bone on bone. 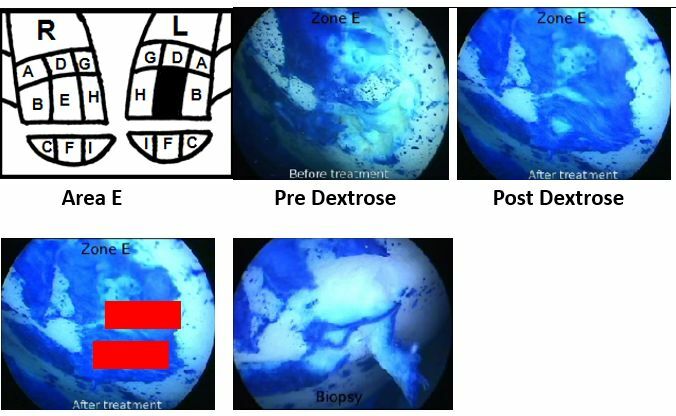 However, to determine if some new growth occurs from dextrose injection Topol et al performed a "proof of principle" study. The abstract from that study is below but here is a picture that illustrates how it was done. The illustration with the R and L and letters shows the areas on the R and L knee from which the biopsy could be taken. The pre and post dextrose picture were taken of the knee and in each case a dye was injected that stains cells. The white area is bone surface that has no cartilage left. The blue areas indicate cells on the surface of cartilage. The Pre Dextrose photo showed a depressed area in the surface of the bone, and the Post Dextrose photo shows some of that area filled in with more cells. The question then is, what kind of cells. To determine that biopsies were taken of areas of new dye uptake. The photo with the red boxes showed the biopsy areas and the picture to its right shows the area after biopsy. These are standard ways to confirm location. Then the biopsies were evaluated for type of cartilage by specialized tests such as quantitative polarized light microscopy (QPLM). Here is the abstract from that study. In addition, 3 readers masked to before or after status of the arthroscopies, evaluated regions A-I on each treated knee to determine which, if any, showed more cartilage. BACKGROUND: Dextrose injection is reported to improve knee osteoarthritis (KOA)-related clinical outcomes, but its effect on articular cartilage is unknown. A chondrogenic effect of dextrose injection has been proposed. OBJECTIVE: To assess biological and clinical effects of intra-articular hypertonic dextrose injections (prolotherapy) in painful KOA. DESIGN: Case series with blinded arthroscopic evaluation before and after treatment. SETTING: Physical medicine and day surgery practice. PARTICIPANTS: Symptomatic KOA for at least 6 months, arthroscopy-confirmed medial compartment exposed subchondral bone, and temporary pain relief with intra-articular lidocaine injection. INTERVENTION: Four to 6 monthly 10-mL intra-articular injections with 12.5% dextrose. MAIN OUTCOME MEASURES: Visual cartilage growth assessment of 9 standardized medial condyle zones in each of 6 participants by 3 arthroscopy readers masked to pre-/postinjection status (total 54 zones evaluated per reader); biopsy of a cartilage growth area posttreatment, evaluated using hematoxylin and eosin and Safranin-O stains, quantitative polarized light microscopy, and immunohistologic cartilage typing; self-reported knee specific quality of life using the Western Ontario McMaster University Osteoarthritis Index (WOMAC, 0-100 points). RESULTS: Six participants (1 female and 5 male) with median age of 71 years, WOMAC composite score of 57.5 points, and a 9-year pain duration received a median of 6 dextrose injections and follow-up arthroscopy at 7.75 months (range 4.5-9.5 months). In 19 of 54 zone comparisons, all 3 readers agreed that the posttreatment zone showed cartilage growth compared with the pretreatment zone. Biopsy specimens showed metabolically active cartilage with variable cellular organization, fiber parallelism, and cartilage typing patterns consistent with fibro- and hyaline-like cartilage. Compared with baseline status, the median WOMAC score improved 13 points (P = .013). Self-limited soreness after methylene blue instillation was noted. CONCLUSIONS: Positive clinical and chondrogenic effects were seen after prolotherapy with hypertonic dextrose injection in participants with symptomatic grade IV KOA, suggesting disease-modifying effects and the need for confirmation in controlled studies. Minimally invasive arthroscopy (single-compartment, single-portal) enabled collection of robust intra-articular data.